This looks like it is going to be so good!!! 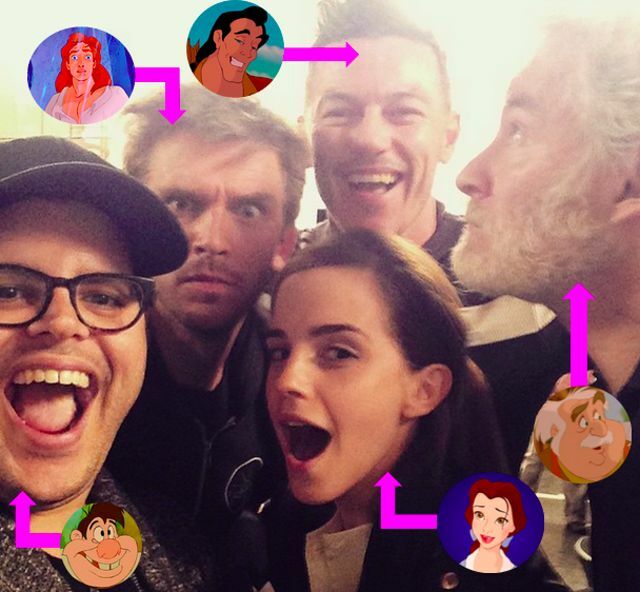 Update on Beauty and the Beast 2017: Spoilers ahead! Dan Stevens, aka The Beast, in his iconic white shirt! New production photos were released today for B&B2017! 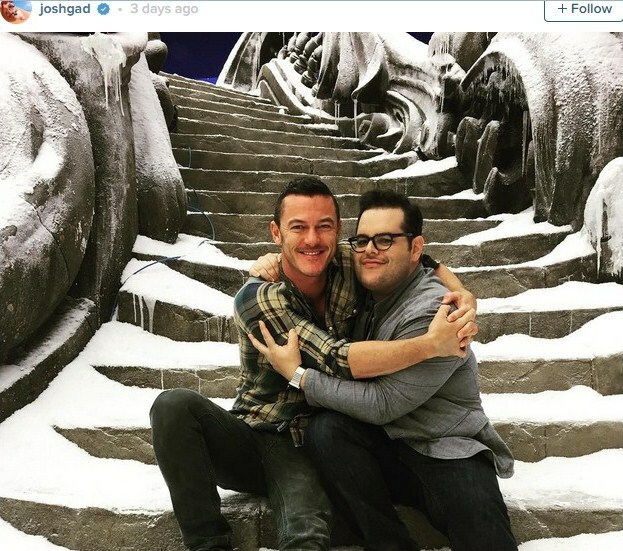 Gaston (Luke Evans) and LeFou (Gosh Gad) in tavern scene. The Beast’s family before the curse. 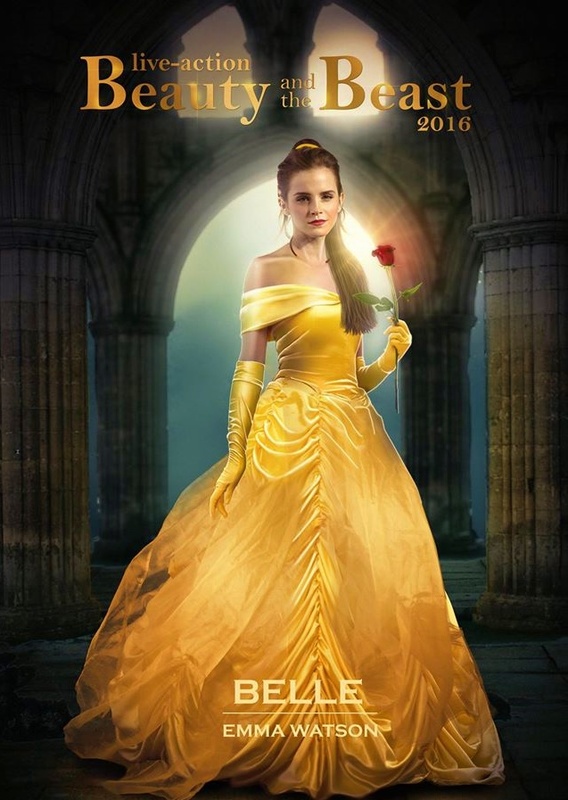 Filming wrapped up for the live action remake of Disney’s ‘Beauty and the Beast’. The cast and their roles. Storyline (for those of you who have forgotten! ): In exchange for her father’s freedom, a young woman agrees to live with a monstrous beast in his castle, and she may hold the key to his salvation. This is rumored to be a much more faithful remake of the original 1991 animated movie, with all the movie’s musical numbers included. Plus, it will finally introduce some (or all) of the songs from the 1994 Broadway musical, like “Home”, “If I Can’t Love Her”, and “A Change in Me”. Movie Release Date: March 17, 2017! Primary cast members on first day on movie set. July 27, 2015: Production is moving along! Movie will be released in 2 years (extensive post-production time needed). See more photos at: Movie set photos. 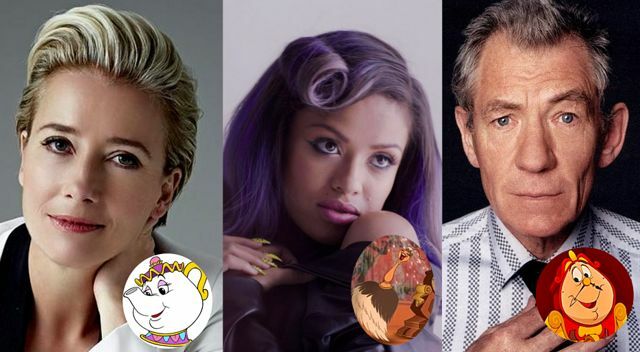 Bonus trivia: Emma Watson (Belle), Luke Evans (Gaston), and Emma Thompson (Mrs. Potts) share the same birth date – April 15th: Emma Watson born in 1990, Luke Evans in 1979, and Emma Thompson born in 1959. Movie release date: March 17, 2017! 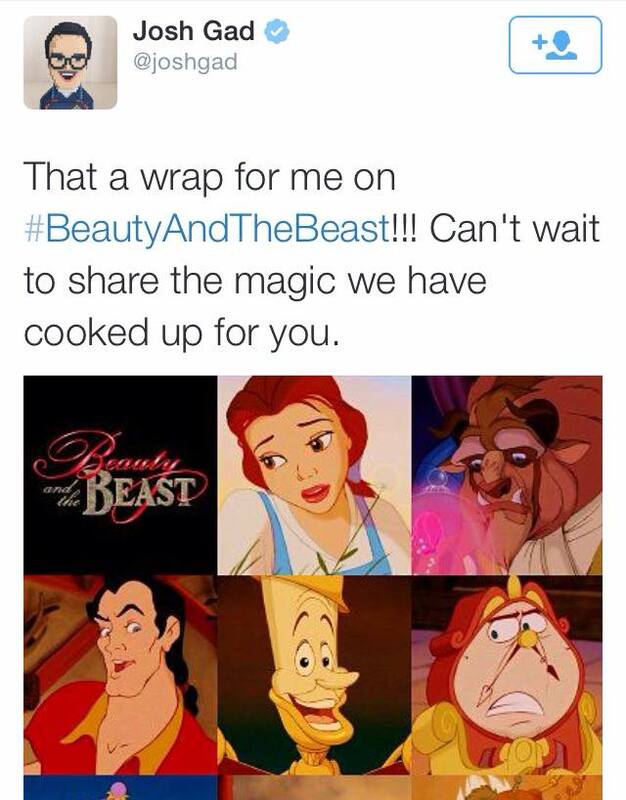 We can’t wait to see it!!! 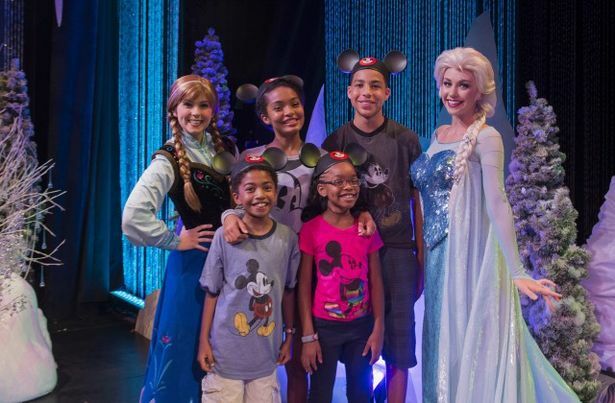 For the second year in a row, the cast of the TV comedy ‘Black-ish‘ has made a trip to Disney World. But, this time they were taping their Season 3 premier episode! 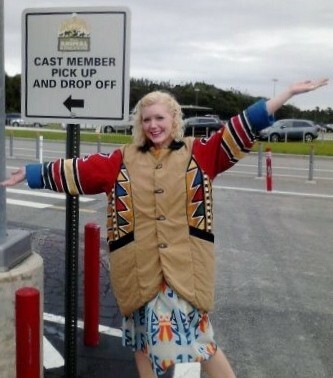 CMs were invited (via the Hub) to be part of the background scene and attend the taping at the Magic Kingdom! The taping went late into the night and the cast was nice enough to pose for photos with park guests even though they must have been very tired! Last night, they were all riding on the new Soarin’ Around the World ride! All the CMs that interacted with them had nothing but nice things to say about the cast and how friendly they were. On the Festival of Fantasy float during the afternoon parade. Watch: “That Baby was Too Old to Be in a Stroller” Hahaha!! The season premiere airs September 21, 2016 at 8:30pm (MDT). 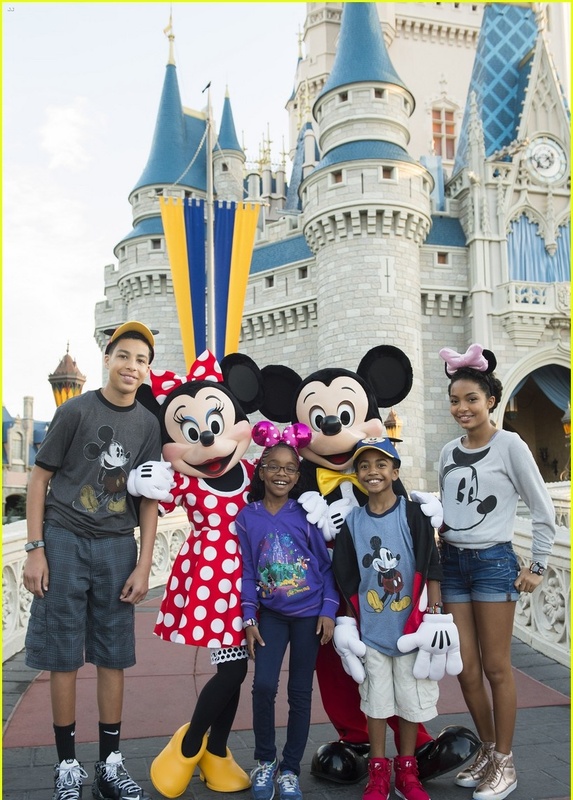 Last weekend, the four actors who play the Johnson family children on ABC’s comedy “Black-ish”, kicked off their spring break together at Walt Disney World Resort in Florida following the wrap of the show’s first season. 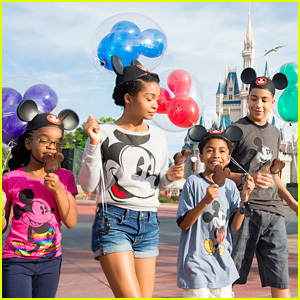 Actors Marsai Martin, Yara Shahidi, Miles Brown and Marcus Scribner, from the cast of the ABC series ‘black-ish,’ enjoying Mickey ice cream bars at the Magic Kingdom. The show, which has new episodes airing through May 2105, has become the season’s No. 1 new comedy in adults 18-49. To celebrate the show’s success, the kids took their spring break time together (along with their actual parents) to get an early start on Walt Disney World’s Coolest Summer Ever celebration at Disney’s Hollywood Studios. The cast at Disney’s Hollywood Studios in front of their sign! 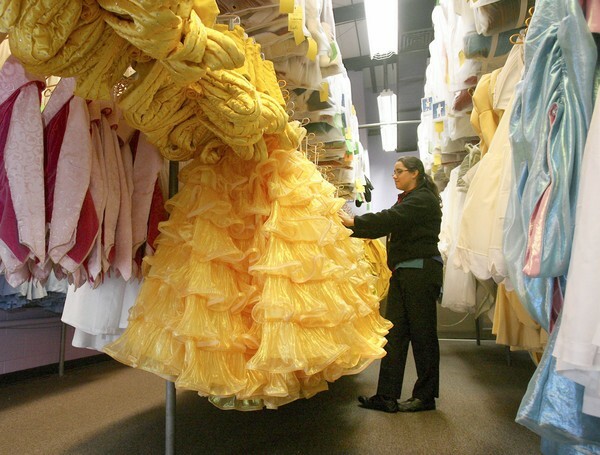 CP Moment: Going to Costuming on your first day of work! 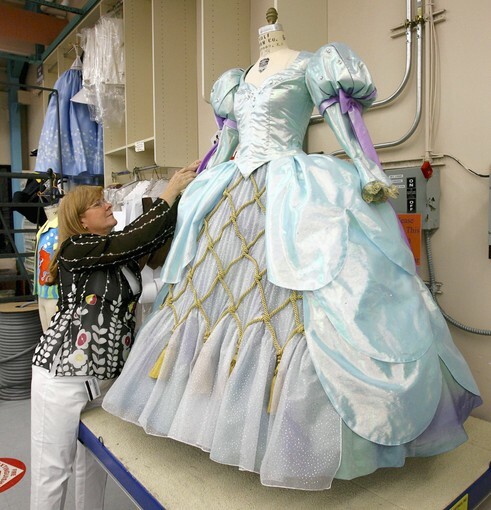 One of the most exciting CP moments is going to Disney costuming for the first time and being fitted for your work costume (what other companies call a ‘uniform’). 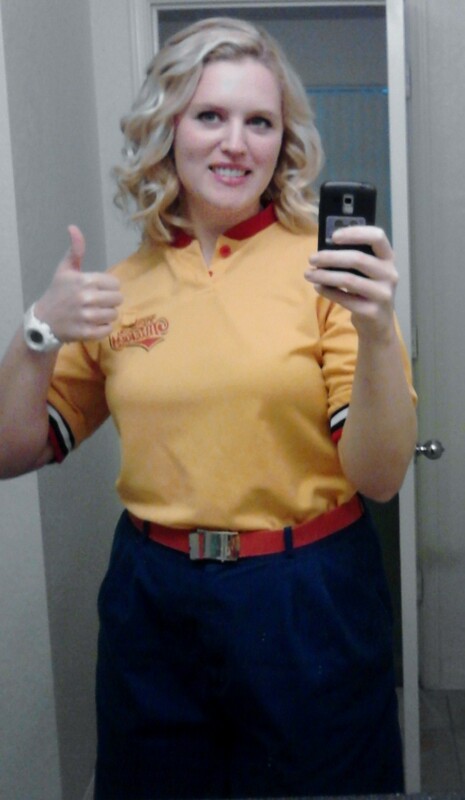 You’re allowed to check out up to five (5) complete work costumes at a time, plus accessories like a jacket and hat, if your costume has one. When your costume gets dirty or wrinkled, you can just trade it in for a clean one. Costumes can also be machine washed and a lot of CPs keep their costumes and wash them themselves if there’s a shortage in their size. The AK costume jacket. Warm! 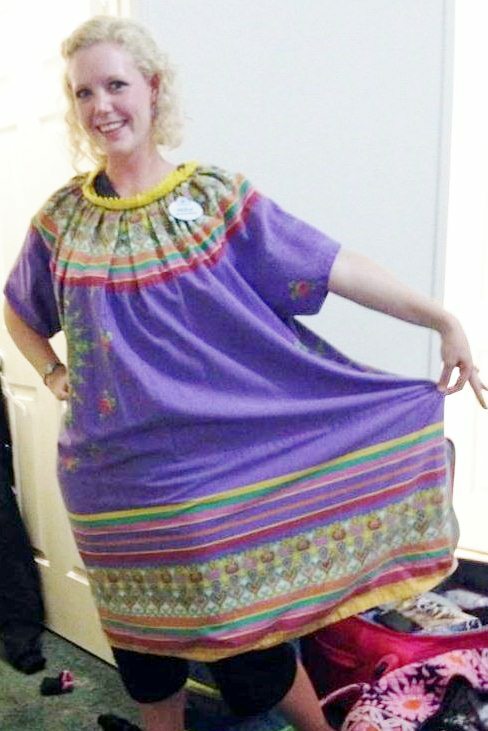 Only size left XXXL – and Caroline took it! 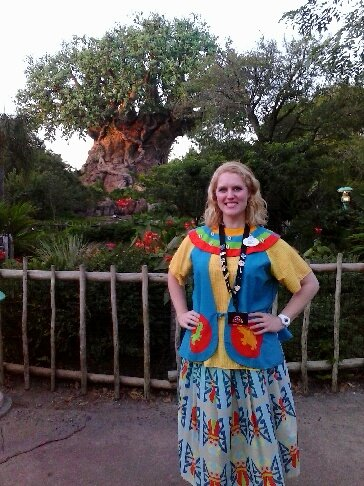 Summer 2015 DAK costume at Strollers Main Gate location. 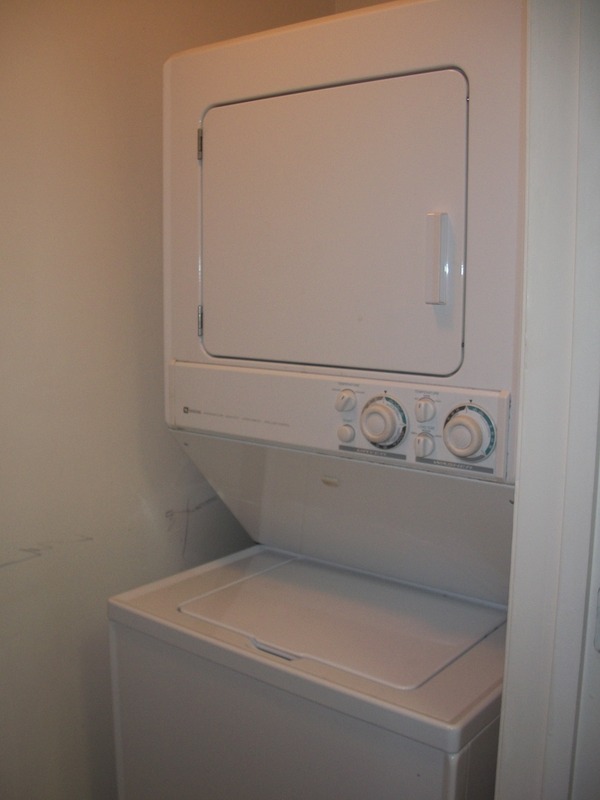 We LOVED having a washer/dryer in our apartment at The Commons!!! We just kept our costumes and washed them ourselves. 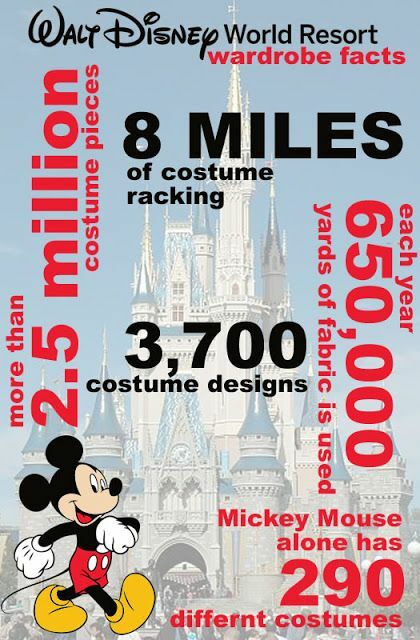 Interested and want to read more about Disney Costuming???? 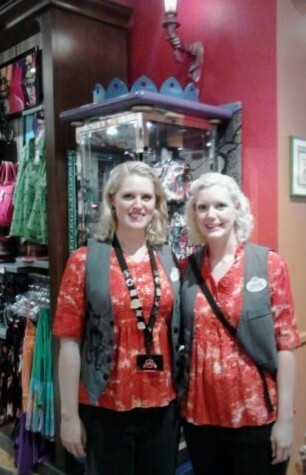 Walt Disney World employs more than 60,000 cast members (’employees’ to regular folks!) 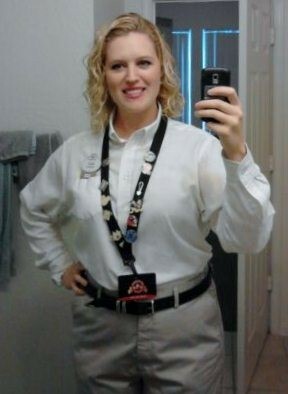 working in positions ranging from housekeeping at the Disney resorts to train engineer at the Magic Kingdom. 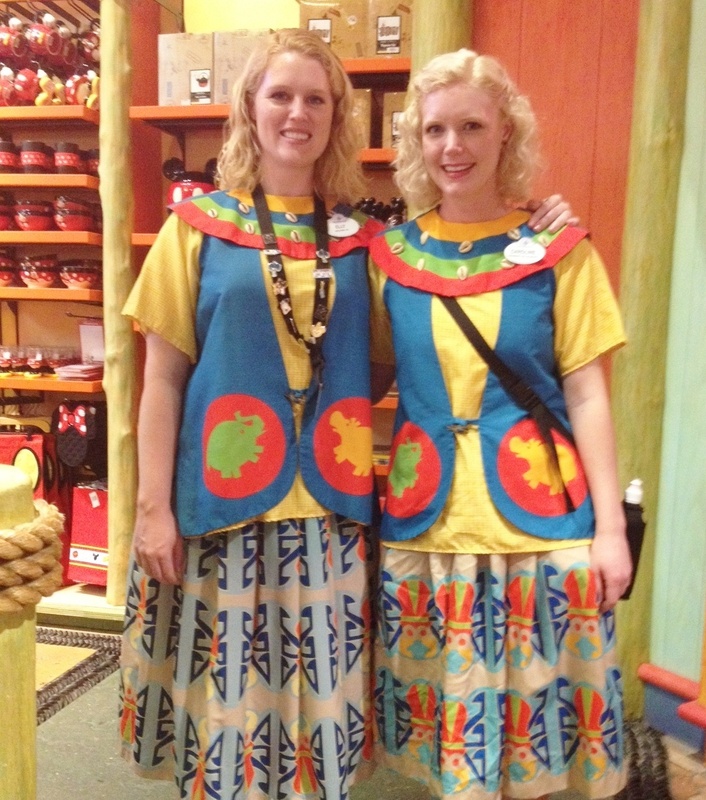 Each day someone has to get these cast members dressed for the day – Welcome to WDW Cast Costuming. 2. 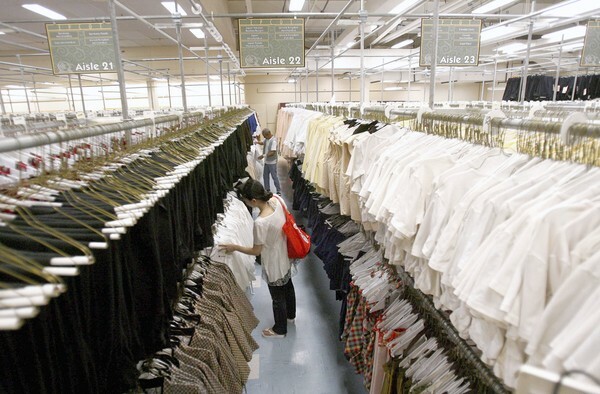 We pick out the correct size and costume pieces from rows upon rows of shirts, pants, skirts, and jackets. 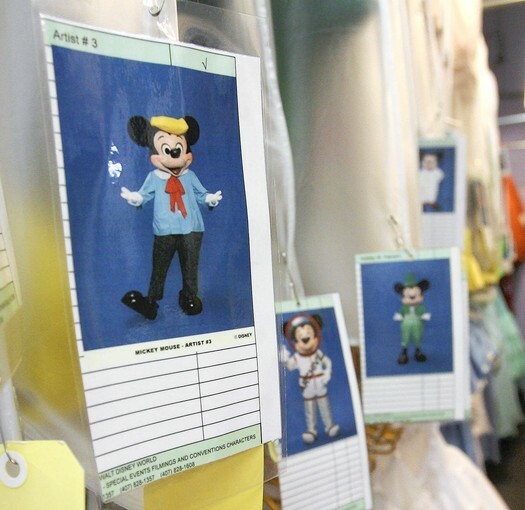 There’s a laminated card or complete costume at the end of each row to show us the costume’s ensemble look. 3. 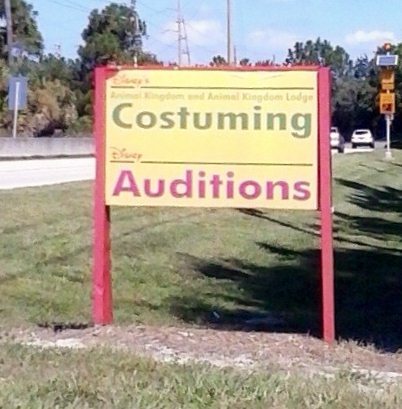 Mickey Mouse has a costume for every occasion and holiday. Each Disney Princess has a summer costume and a winter costume. 4. Disney provides the work shoes for some roles (i.e., food service), but for most locations they just provide strict guidelines on shoe wear and CMs must pay for their own shoes. 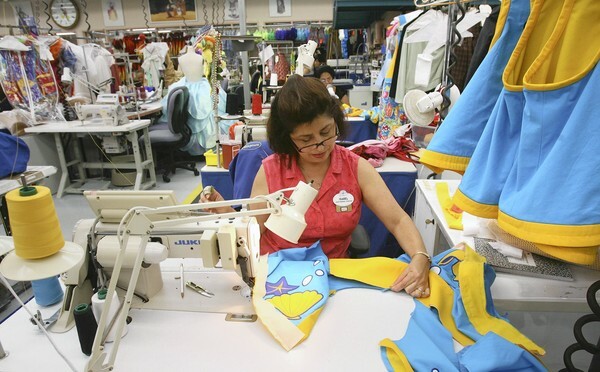 A talented CM making one of Donald Duck’s summer costumes. 5. 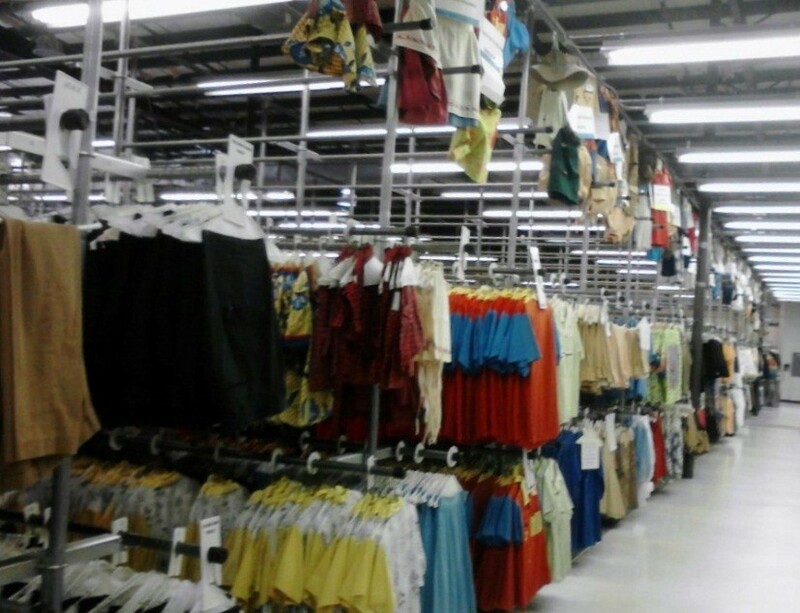 Every day, all returned costumes must be tag scanned, repaired, cleaned, pressed, and restocked on Costuming floor. 6. If we return a piece and it doesn’t get scanned right, or if we lose a costume piece like a belt, we are charged a full replacement price, at least $25 per item! 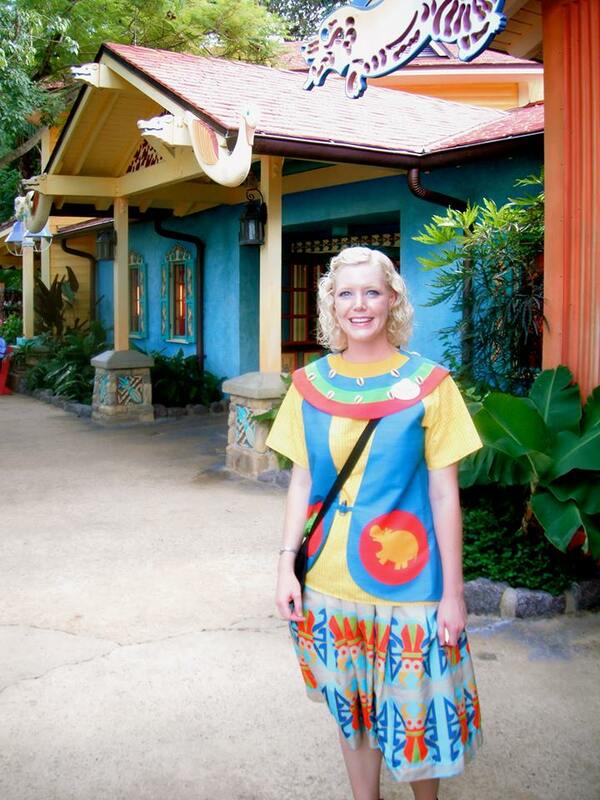 Caroline’s work costume was actually the inspiration for one young guest visiting DAK this summer!! How cute!!! Caroline had some vinyls made up of her favorite costumes! 50 Moments Everyone Has on the DCP! CP Moment #2: Realizing that you made it through the DCP application process! CP Moment #3: Notifying your school that you’re taking a semester off. CP Moment #4: Getting the DCP acceptance postcard in the mail. After months of waiting and planning, you’re finally here!!! Welcome!!! CP Moment #6: Moving into DCP housing on the first day of the program! So happy to be at Disney World!!! CP Moment #14: First day at your new job meeting other CPs. CP moment #15: Safety D begins with me! CP Moment #22: Disney snacks! Having dinner with your roommates. 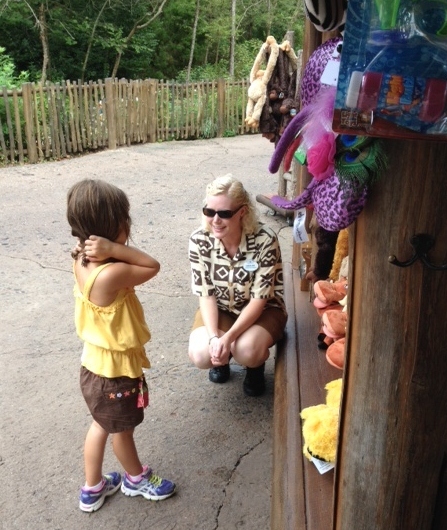 CP Moment #29: When family and friends come to visit you during your program and you get them into the parks for free. CP Moment #32: Monthly apartment inspections! CP Moment #37: Mickey’s Retreat! CP Moment #40: Playing in the parks with your friends! CP Moment #43 : Watching Wishes with your CP roommates. Getting into Blizzard Beach…for free! CP Moment #44: Going to the Winter Formal Ball with your friends. CP Moment #45: Comp admission to other Disney theme parks. CP Moment #46: Spending holidays away from home, but with your CP friends. CP Moment #47: Shopping at Cast Connections! Extending your program because you’re not ready to leave after just 4-5 months! Debating if you should stay on with Disney and apply for an extension or professional internship. Getting accepted for a PI next semester!!! Watching it snow on Main Street USA! CP Moment #48: Service ceremony with Mickey! Watching Wishes over the Cinderella Castle for the final time as a Cast Member. Getting ready to go home and back to school. Learning something new every day, including learning about yourself. 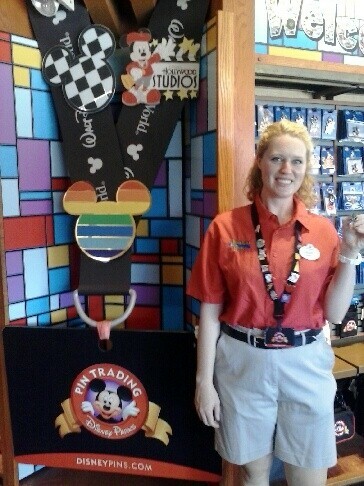 And finally, CP Moment #50: Becoming a DCP Alumni! Knowing that as a DCP alumni, you’re a part of the Disney legacy. Never stop believing in the Magic of Disney! Yes!!!! 2017 will be the best year ever!!!! Shanghai Disneyland finally and officially opened June 16, 2016 to good reviews, big crowds, and rainy overcast skies. Daily tickets cost ¥499.00 CNY or about $79 US. You can buy 1 or 2 day park tickets. Shanghai Disneyland prides itself on offering a culturally distinct experience—imagined especially for China and designed for guests of every kind. 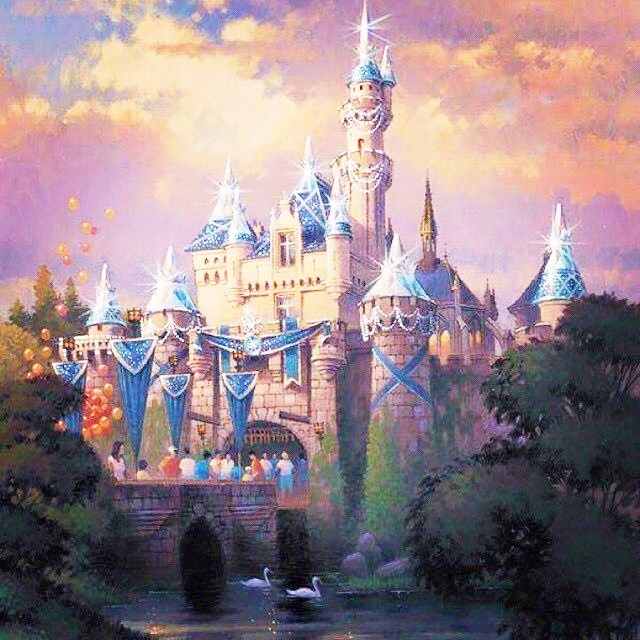 The castle at Shanghai Disneyland is Disney’s biggest one yet! IT’S HUGE!!! Shanghai Disneyland continues the tradition in new and unique ways, through never-before-seen lands like Adventure Isle, Treasure Cove and Gardens of Imagination, and one-of-a-kind attractions and experiences. That includes the largest castle in any Disney theme park around the world! Free Opening Day buttons were given out to all the guests. The building cost was initially estimated at 24.5 billion yuan (USD $3.7 billion) for the theme park and an additional 4.5 billion yuan (USD $700 million). This rose to around USD $5.5 billion before delays, which was due in part to additions to the number of attractions open to the public on opening day, which added USD $800 million to the cost. The added cost doesn’t take into account lost revenue from the lost admissions fees. This huge overrun and opening delay caused massive layoffs and cut park hours at the other Disney theme parks, especially at Disney World and Disneyland. We love collecting Disney pins! The soft park opening started in May 2016 to test out everything. Some guests were tagged as “uncivilized” by local media for their behavior during the theme park’s first few days of operations. The park trashed at closing every night. Photos of food wrappers, plastic bags, paper cups and other trash that littered the park grounds were shared on Chinese social media and local news sites. Trash left by a family after they finished their picnic lunch. Disneyland’s New Eastern Gateway Parking Lot Opening 2018! The Eastern Gateway. Finally! Parking at Disneyland has always been a struggle! Disneyland Resort is planning to break ground soon on their Eastern Gateway, a new arrival point that will provide guests even more choices for access and parking when it opens in late 2018. This project on the east side of the Disneyland Resort will include a new parking structure with 6,800 spaces, a new transportation facility and an elevated pedestrian bridge. The new pedestrian pathway and elevated bridge over Harbor Blvd. will directly link guests arriving at the parking structure and eastern transportation facility with the main Disneyland Resort entrance plaza. Location of the new parking structure looks great! The pedestrian bridge will link to this DLR entry spot. Perfect and long overdue as anyone who has driven on Harbor Blvd. – or as a pedestrian waiting at the crossing light – will tell you! They’ve need more parking nearby, especially for guests going to Downtown Disney for the evening. Downtown Disney badly needs some close by, non-resort parking for its guests. 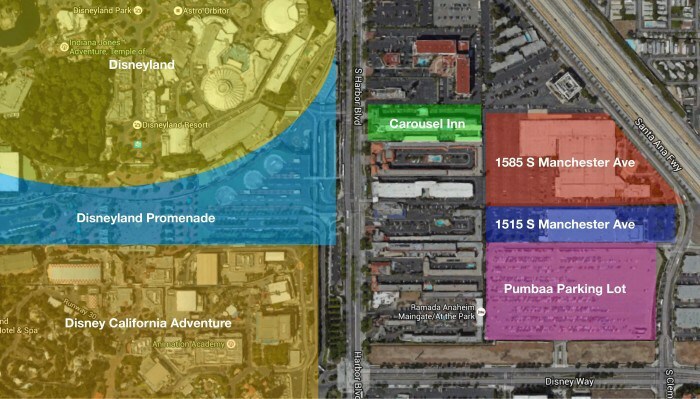 The OC Register reported that Disneyland Resort acquired 1515 and 1585 South Manchester Avenue for the purchase price of $48 million. Disney also purchased the Carousel Inn April 2015 for $32 million. 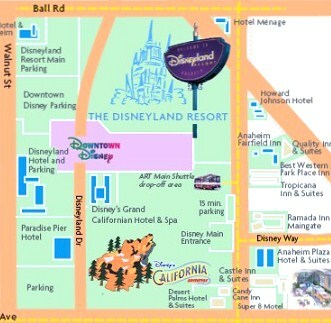 Two parking lots are available at Disneyland: Mickey and Friends and Toy Story. Both are far away from the park’s entrance and require bus service. Right now, guests can park at two Disney parking lots: the Mickey and Friends parking structure or the Toy Story parking lot. Mickey and Friends Parking Structure is a six-level facility and is the second largest parking area in the world. (The largest is at Tokyo Disneyland.) 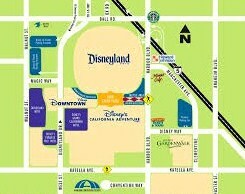 There is tram service from the parking structure to the Disneyland Main Entrance Plaza. Restrooms and drinking fountains are located near the tram loading area under the escalators. Wheelchairs/ECV users will be directed to a special parking area, then proceed to the wheelchair/ECV ramps in the tram loading area. For the Toy Story Parking Lot: There is bus service from the lot to the shuttle bus area on the east side of the Disneyland Main Entrance Plaza. 2016 Costs — Parking is $18.00/day for cars, $23.00/day for “oversized” vehicles, and $28.00/day for buses and tractors with trailers. Annual passholders who have the parking option on their pass may park in either facility at no additional charge. We expect parking fees at the new structure to be $20/day. Disneyland 60th Anniversary Celebration is Coming to an End! 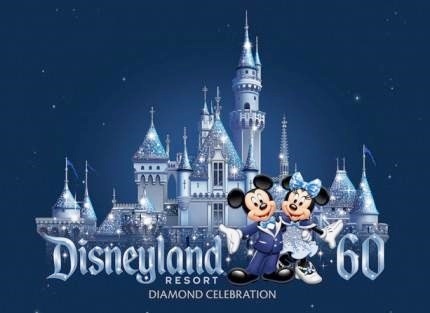 For the past year, Disneyland has been celebrating sixty years as the ‘Happiest Place on Earth’ with its Disneyland Resort 60th Diamond Anniversary Celebration. May 22, 2015: The 60th Diamond Anniversary celebration began on Main Street USA! Featuring the all-new “Paint the Night” parade (leaving soon!! ), “Disneyland Forever” fireworks and “World of Color – Celebrate!”, as well as special food and merchandise, the celebration has also brought a special sparkle throughout the Disneyland Resort – including a diamond-encrusted Sleeping Beauty Castle. We couldn’t miss seeing this celebration! The Disneyland celebration will continue to dazzle guests only through September 5, 2016! The whole park is so beautiful! Take a look at this Best Day Ever video of The Happiness Place on Earth: Best Day Ever at Disneyland! Are you ready for some anniversay pin trading fun? Pins, pins, and more pins! We bought 10 of them! Some of the 60th Diamond Celebration pin releases. Disney is releasing more than 100 pins (yes, you read that correctly: 100!) during the 60th anniversary celebration! 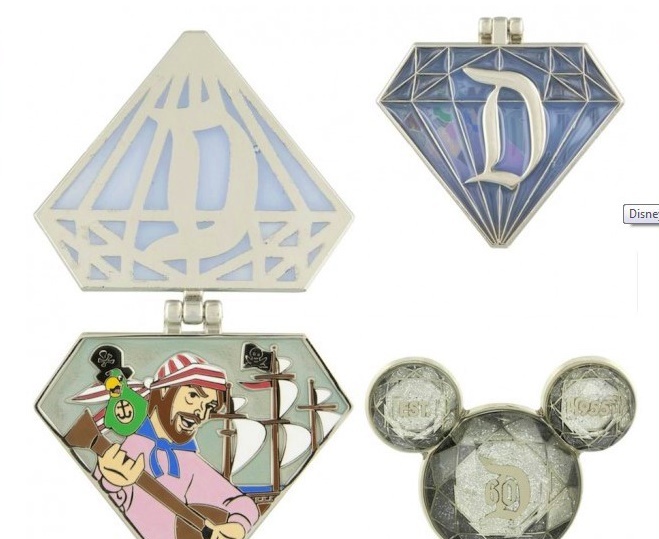 For Disneyland Annual Passholders, there’s a special series of pins created just for you! These dazzling diamond shaped pins will release bi-monthly until August 2016. They feature stained glass and a hinge that opens to reveal beloved characters and attractions. CP Tip: Remember you must present your valid Disneyland Resort Annual Passport or Premier Pass and photo I.D. at time of purchase for these extra special pins. So much anniversary merchandise! Something for everyone!!! Our new Disneyland mugs. We love the handle! Shhhh…some of this Disneyland 60th anniversary merch is now showing up at the Cast Connections store at WDW!!! The Paint the Night parade is leaving Disneyland…but coming to WDW!!! Disneyland’s 60th Anniversary celebration ends 09/05/2016! Don’t miss it!